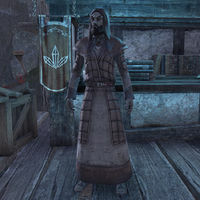 Adras Sarethi is a Dunmer mage who can be found at the docks of Shad Astula. He will trade you a Dunmer book during your mission to aid Rigurt the Brash in his cultural exchange. When approaching the docks of Shad Astula, Adras Sarethi greets you, "Welcome to Shad Astula. I maintain the school's collection of manuscripts and books." I have something you might be interested in. It's ... unusual. "Maybe, but I've seen it all. I don't think anything could surprise me anymore. Looking at the book, Adras is genuinely surprised, "Oh. My. Do you know what this is? It's an original edition of "The Art of Love and Swordplay" of the Nord poet Fjokki." "It details, in epic balladry, the carnal exploits and adventurous deeds of the warrior poet Fjokki. The author claims the work is a true history, but many of the exploits it recounts are, well, highly unlikely." Who's Fjokki? / So who was Fjokki? "Fjokki was a bard of exceptional imagination but decidedly limited skill. According to his epic stanzas, he never met a creature he couldn't make love to or kill. Or both." I was hoping to trade it for a book on Dunmer culture and etiquette. "Dozens of works describe individual aspects, but nothing really encompasses that vast and labyrinthine subject. Try this one. "The Dapper Dunmer." It's all yours." Do you have a book of Dunmer insults, taboos, and social blunders? "It's an axiom that there's no such thing as a Dunmeri joke book, but this is close: "The Dunmer dunce."